I have a 1985 Honda Accord, it has been wonders for me. Only paid 650$ for it, only had to get 4 new tires for it. Had it for two years. One day the brakes failed completely. I had to E-brake it home. I replaced fluid, no problem. Few months later, same thing happened again. Realized there is a significant problem, take off front wheels. Caliper seal busted on passenger side. Replaced both calipers, both brake pads. Drums on the back were in OK condition (expensive special order part on these drums). I filled brake fluid reservoir, bled the brakes with some assistance from family. The brakes had build up some pressure, there were no bubbles coming out of the bleeder valves on the brake lines. We turned the car on, the brake reservoir drops to nothing, we lose ALL brake pressure, and there is a huge cloud of smoke around the car. I am no "genius", but I am assuming this is the brake fluid burning off in some way. I am not a complete genius with cars, but does the brake system link up with the exhaust at some point? Im thinking brake booster, or master cylinder. You need to replace the master cylinder and the brake booster. The master is leaking into the brake booster. The engine is burning the brake fluid and getting it through the brake booster vacuum hose. That has to be it. Check everywhere fluid goes on some schedule. Flex hoses, wheel cylinders etc. Ok thanks a bunch, I know exactly where the master cylinder is, the brake booster, however might take a little bit of digging to locate. I will probably be picking up the parts soon. Master cylinder: Available and special order too. Get the complete one with reservoir and cap. Neither were very pricey for this! So ive got the master cylinder coming later, as well as the brake booster. Going under the hood I see bolts connecting the brake lines, I see the hose that runs from the engine. Is there any really elaborate steps to remove these two parts or is it simply bolts and the vacuum hose? Should be mostly nuts and bolts. Rusted anything could be a pest. Flare nut wrenches for lines. Hope info comes with parts but pay attention to vacuum booster if adjustable there doesn't need to be some freeplay before it pushes on master cylinder. If not brakes would not return fluid well or at all after applying brakes. Not sure if adjustable or the spec. Check at brake pedal now with a finger how much is almost nothing before resistance as a clue. Bench bleed master cylinder first off of car. Instructions and probably a kit to help should come with new one. If not say so but basically you put lines in outlets while body of master is held in place like a vise and push on end that goes to booster returning fluid to reservoir watching for it to be free of bubbles. If no kit in the box you could/should just get some short pre-made lines that fit and make your own. Think about the check valve at the booster to toss that too along with the vacuum hose, clamps if needed. Bleeders at all wheels need to work when all installed and finish with bleeding whole system. If you run into any problems just ask and someone here can dig out some details. It's possible to have something hard to get at for fasteners but I don't know of any special tools just for this job. Here's some procedures that I found out there. AYOR for accuracy. Getting to fasteners you can't even see is a pest. There will be a way to get at it. If equipped with an air bag, disconnect the negative battery cable and properly disable the Supplemental Restraint System (SRS), as detailed in Chassis Electrical . Disconnect the vacuum hose at the booster. Remove the master cylinder. Plug the brake lines immediately. Place the master cylinder in a clean, protected location out of the work area. Remove the brake pedal-to-booster link pin and the 4 nuts retaining the booster. The pushrod and nuts are located inside the vehicle under the instrument panel. Remove the booster assembly from the vehicle. To install, reverse the removal procedure. Tighten the 4 retaining bolts to 10 ft. lbs. (14 Nm). If equipped, enable the SRS system and connect the negative battery cable. 4. Remove the brake pedal-to-booster link pin and the 4 nuts retaining the booster. The pushrod and nuts are located inside the vehicle under the instrument panel. Here is a possibly really stupid question, should the brake booster have brake fluid in it? No, the booster holds vacuum to assist the braking action. The brake fluid that's in the booster now is what your engine was burning. That's why you are replacing it. I found the pin, got it off.....disconnected the brake pedal. I have one bolt to get to, need a ratchet, which is en route. I also noticed I had brake fluid leaking from the brake pedal onto my floor mat, just never noticed before. How was a fully functioning brake booster hold the fluid at bay and not into the brake booster itself? Brake booster works by using engine vacuum assisting the master cylinder. When the booster fails as well as the master cylinder, that engine vacuum will allow the leaking brake fluid to enter it and be burned through the engine. Brake fluid inside the car justifies a bad master cylinder. Re: Link pin: Couldn't find anything exact for a pic of what and how. Something holds the pushrod to booster from pedal from just flying around. Hitch pin, something acting as a cotter pin. Whatever way would be made to not just rattle loose. Gotta find it and it must be in good shape for re-use.............MANDATORY! That pic again. Is it the item to the right that has no clearance? Does the replacement have it in place same as old one? Smile but you are there and I'm guessing at what is in the way to jockey this thing out. What is in the way of pulling it straight forward then some angles now? Where is the most problem, inside the car or outside under the hood. If engine itself is the stopper be sure if that's a last resort to tilt it or remove what is in the way. I'm at a loss without looking right at it as it is now. I'm not ready to say detach anthing that is on the replacement booster. Note: I'm here a lot checking in but can't be watching all the time for question if you are waiting. Do think thru anything you may need to move out of the way such that you can put it all back properly. If brake lines are a problem from master those should have enough to flex out of the way but be sure when you hook those up they are not cross threaded into master before you tighten those up. Is the vacuum hose going to the booster securly plugged in at both ends? Do you hear any hissing noises? Yes, its good. I am being led to think I need to adjust the idle. Ok, so after having a my brother-in-law look at it, it appears that the throttle cable was partially messed up where it enters the engine bay (partly due to the massive bending and twisting required to move the master cylinder and brake booster into place). The idle has dropped significantly, still a little high. After burning off the brake fluid that had been previously dumped in the engine. Brakes are good, no fluid drop. Engine idles about 500-1000 higher than normal. So here is the new and final question on the repair of this damn car. Can you lower the throttle idle on the carb, as opposed to replacing the entire throttle cable? At this point its a matter of convenience, I DONT want to detach hoses and move this and move that. This was definitely quite a job, and I am very very grateful for the help and advice yall have given me! So far that showed for me? Your choke is about where it would be about 10 seconds after you start it up cold as in on fast idle. The rod that goes to the choke thermostat you should be able to open choke fully to test for that binding. 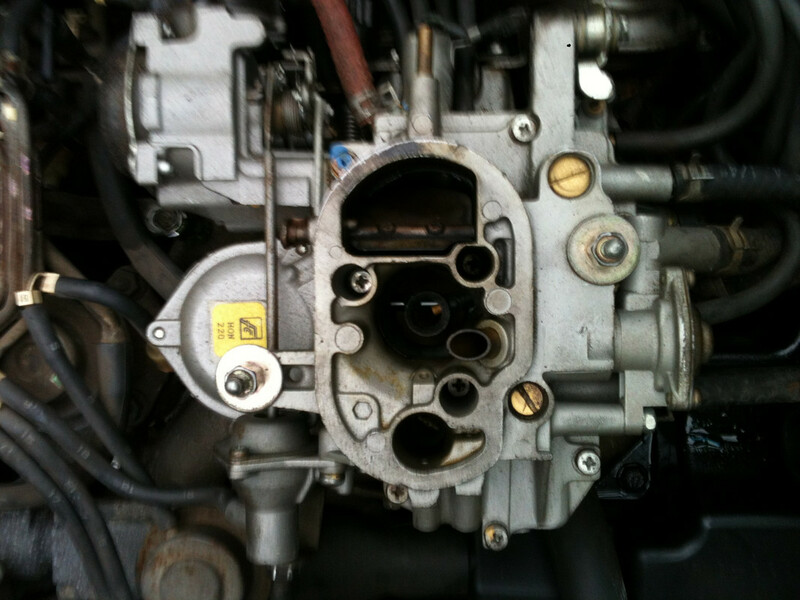 You would then need to hold throttle up some (all this engine off) and that choke plate should be free to move. This is a mind game now - what temp was the engine at when you took that picture #2 on you list of them back a couple posts? If that choke in the black housing top left in that pic can't shut the choke off via electric heater probably or possible exhaust heat (doubt that for 1985) it's going to race like it's cold. In that the problem just started with this job my bet is it is electrically heated to shut it off and the choke plate would stand up wide open and all would be just ducky. Many that are electric heated if you just put key to run without starting engine would heat that up to the touch from cold and shut or at least feel that housing warm to hot to the touch. Check wire and that housing metal bracket is in fact ground -- that hoop that holds it in place. Your post posted before I posted mine. If throttle cable doesn't allow carb to return to its base idle you will need to work on that. Careful of those things as if you get that wrong the other way when you put gas pedal to floor you are torquing on the carb and can bust it. You won't like the price of that! Keep it here for now as a problem from doing the booster job. Again you are there looking so have the advantage. My caution about a throttle cable is that the carb itself is NOT supposed to be the stop if you understand me. If you have it just right the gas pedal would be hard to the floor (engine off) right at the point the throttle is wide open at the carb.